Today is World Food Day. According to the World Food Program, over 805 million people do not have enough food to live a healthy life and 66 million primary school children go to school hungry in developing countries every day. The facts speak for themselves. Hunger and poor nutrition are issues of global concern, which manifest most visibly in children, causing death and exacerbating diseases such as malaria, diarrhoea and pneumonia. At Projects Abroad, we are trying to address global food inequality through our various Nutrition programs in local communities. 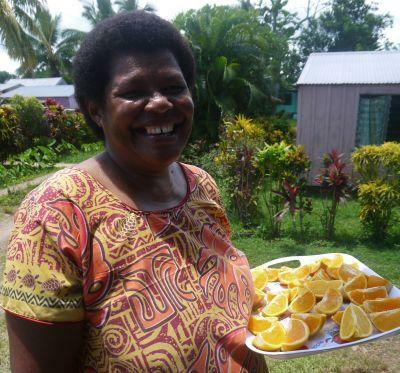 Projects Abroad’s Nutrition and Wellness Pro ject in Fiji is located in rural villages close to Nadi, on the west coast of Viti Levu. The staff and volunteers working on this project are encouraged to adopt a holistic, hands-on approach with the local participants, helping these people to make healthier choices for themselves and their families. A health screening process targets four key modifiable behavioral risk factors, including tobacco use, physical inactivity, excessive use of alcohol and an unhealthy diet. Volunteers test local participants and use the results to create a 21-day health and wellness program tailored to the individual’s needs. Volunteers also host workshops addressing nutrition and healthy lifestyle concerns and hold cooking demonstrations promoting healthy eating. The Nutrition project in Peru works in a similar fashion. The country is known for chronic malnutrition with nearly a third of Peruvian children in rural areas suffering from the former, with Cusco being one of the worst affected areas. Volunteers are based in a healthcare center in Cusco and focus on educating and supporting the local populace through a nutrition program devised co-operatively with the local municipality of San Jeronimo, the local health administration, and Peruvian nutritionists, nurses and technicians. Volunteers work with local nutritionists, conducting home visits, workshops, food distribution, nutritional research, health check-ups and awareness campaigns. The current program seeks to implement sustainable dietary and lifestyle changes for children aged between 0 and six, as research shows that this is a particularly vulnerable age group. With so many people facing starvation, it’s time for drastic action. Join us this Food Day on one of our nutrition projects and help people to change their lives by making healthier diet and lifestyle choices.